The supercomputer Cray XC50, called NS-05 “ATERUI II” began operation on June 1st, 2018. The ATERUI II, with a theoretical peak performance of 3.087 petaflops, is considered to be the world’s fastest supercomputer for astrophysical simulations. The ATERUI II mimics a wide range of astronomical occurrences inaccessible to observational astronomy, allowing researchers to confidently go where no one has ventured before, from the birth of the Universe itself to the inner regions of a dying star. 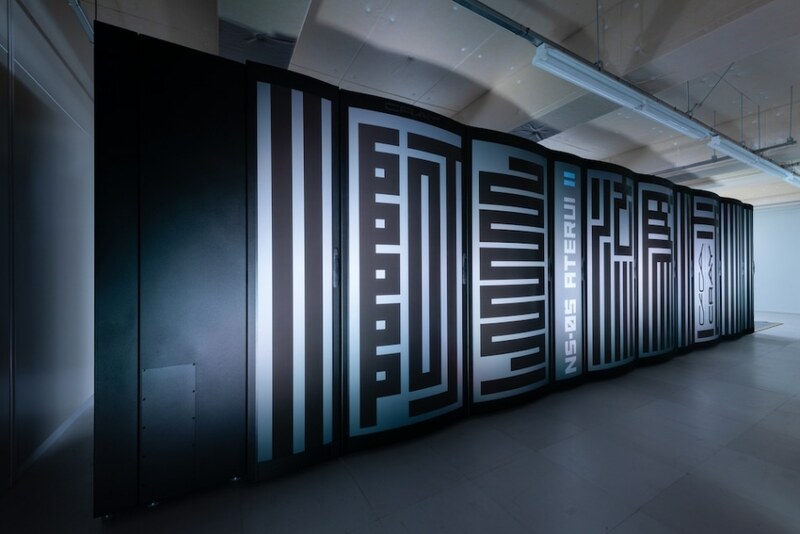 The ATERUI II is an enormous parallel supercomputer and the 5th generation of systems run by the National Astronomical Observatory of Japan (NAOJ). Connecting forty thousand cores allows the ATERUI II to calculate quickly. The ATERUI II has three times better performance than the previous “ATERUI” system. Due to a high-speed network, astronomers can access the ATERUI II from their home institutes. In this year, around 150 researchers will use the ATERUI II. With its greater computational capability, the ATERUI II will handle problems very difficult for earlier computers. For instance, the ATERUI II can calculate the mutual gravitational forces among the 200 billion stars in the Milky Way Galaxy, instead of clustering them into groups of stars the way other simulations do. In this way, the ATERUI II will produce a full-scale high-resolution model of the Milky Way Galaxy. Computational astronomy is still at its infancy compared to observational astronomy, in which scientists use telescopes to study celestial objects and occurrences, and theoretical astronomy, where scientists describe the Universe in terms of physical laws and mathematics. As a result of the rapid advancement of computational technology in the last few decades, astronomical simulations to recreate phenomena, celestial objects, or even the entire Universe within the computer, have grown as the third pillar in astronomy. “Aterui” is the name of a historical hero who lived in the Mizusawa area, where the ATERUI II is situated. Together with his comrades, he fought bravely against conquerors about 1200 years ago. The ATERUI II is named after this courageous hero in hopes that it will boldly face the daunting enigmas of the Universe. The reimagined tensyo kanji (traditional block style lettering) for “ATERUI II” (阿弖流為 弐) designed by artist Jun Kosaka is printed on the housing.